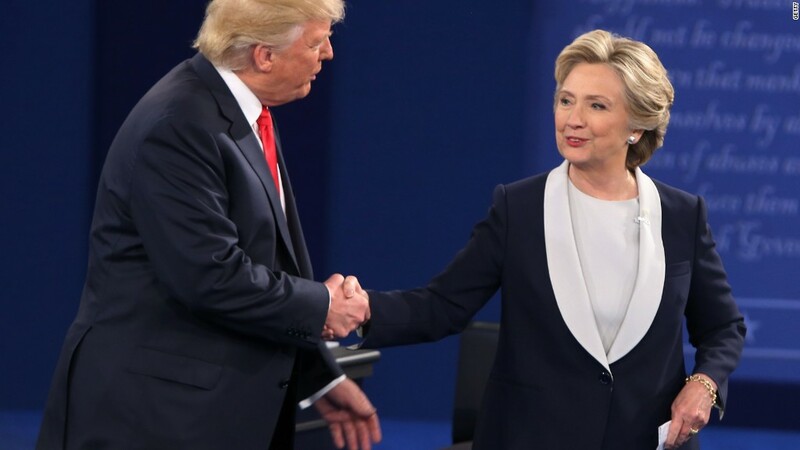 Donald Trump still has the edge over Hillary Clinton on the economy. 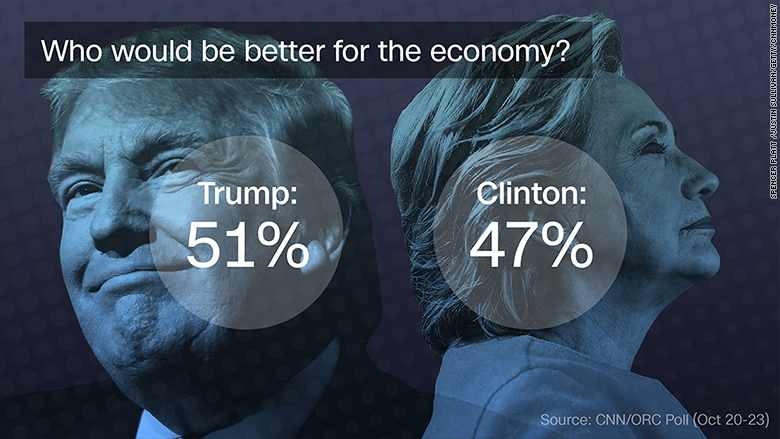 When voters are asked: Which candidate would better handle the economy? The majority -- 51% -- of likely voters pick Trump. Only 47% pick Clinton, according to the latest CNN/ORC poll. It's been an ongoing problem for Clinton. She's leading in the polls overall and most big-time economists back her, but Main Street voters still aren't sure she has the chops to deliver more jobs or higher wages. "Trump has my support first because I think he has the kind of intelligence that's necessary at this point to come up with the solutions to economic problems," Ivan Torres of Reading, Pa. told CNNMoney. Torres plans to vote for Trump. He's not a huge fan, but he looks around his struggling part of Pennsylvania (Reading is one of the poorest cities in America) and thinks jobs matter most of all. On every other top issue -- terrorism, immigration, foreign policy -- Clinton beats Trump. The latest news that Obamacare premiums will jump 22% next year is only likely to add to the headaches for Clinton and other Democrats as they try to make their case that they can lead the way on pocketbook politics. "Obamacare is just blowing up," Trump was quick to say Tuesday on the campaign trail in Florida. He pledged again to repeal it and also bring back jobs from overseas. In contrast, Clinton's plan is "family first" economics. She wants to tax the wealthy (those making over $250,000) and give more benefits to the middle class and poor such as pre-school for all four-year-olds and debt-free college. "I am so looking forward to working with [Senator Elizabeth Warren] to rewrite the rules of our economy to make sure we both grow it and make it fairer for every single person working hard here in America," Clinton said at a rally this week in New Hampshire. But while most voters acknowledge they are better off than they were in the 2008 crisis (unemployment is at only 5%), they still feel anxious about the economy, especially for their children. Related: Presidential race is hurting economy -- true or excuse? Trump cast himself as a businessman and, more importantly, a change from the same-old Washington D.C. policies that have led to stagnant middle class wages for roughly two decades. Whoever wins the White House on Nov. 8 won't face the same catastrophic economy that Barack Obama had to deal with in 2008 and 2009. But an ongoing message from the voters this election is: We're still frustrated with the economy. The next president will have to deal with that -- and possibly do so in the midst of a recession early in his or her term.